Do you know what causes the volcano eruption? Originally, the interior of the earth fulfilled with magma and the swollen bubble. 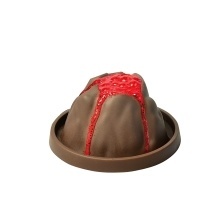 Under the extreme pressure, the magma will break through the earth from the very weak point and spout. That causes the volcano. The is one DIY Experimental device about volcano eruption. The children can wittiness the whole process of volcano eruption and know its working principle through doing the experiment by themselves and they will enjoy the great fun from this exploration. Education – Children do the Volcano Eruption experiment by themselves and find how it was happened. Learn about some Chemistry and Physics knowledge. Multi Fun – Kids can play together and help each other to finish this experiment. Parents also can join in and adds parent-children interaction. Enhance Ability – By doing the experiment, your kid&apos;s hands-on ability, thinking ability, team collaboration ability will be improved. Children Learn Gift – It is a good study toy for kids, a fun and educational gift for them. Note - Suit for kids above 10 years old and kid&apos;s adult needs to be guided if it is necessary. Please do the experiment by following the instruction.